1939 Born in Bangalore. Doctoral Member, World University, Arizona. Ex-Executive Member, Asian Christian Art Association, Yogjakarta. Member, International Society For Education through Art, USA. 1983 State Guest, International Visitors Program, USIA, Washington DC. Lives and works in Chennai. 1962 Graduated from Govt. Colleges of Arts and Crafts, Madras. 1963 Awarded National Scholarship to undergo specialised study in painting, Ministry of Education and Culture, Govt. of India, New Delhi. 1995 Recipient of Culture Doctorate in Art Education. World University, Arizona. 1965 Participated in Commonwealth Art Festival, London. 1977 Solo exhb., sponsored by Aliance Francaise, Taj Coromendal Gallery, Madras. 1977 Solo exhb., Aliance Francaise Gallary, Bangalore. 1978 Solo exhb., Taj Art Gallery, Bombay. 1979 Solo exhb., BF Larsen Gallery, Brigham Young University, USA. 1979 Solo exhb., De-Schakel Leisen Hauge, Holland. 1980 Solo exhb., Burgezzal Zwijndrecht, Holland. 1981 Solo exhb., Sarala Art Centre, Madras. 1981 Solo exhb., Venkatappa Art Gallery, Govt. Museum, Bangalore. 1982 Solo exhb., Rosa Speer Laren, Holland. 1983 Solo exhb., International YMCA Gallery Osaka, Japan. 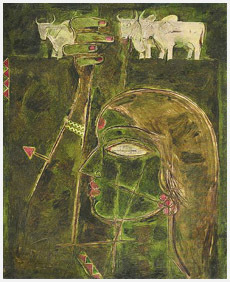 1983 Solo exhb., Contemporary Art Gallery, Ahmedabad. 1983 Solo exhb., Doshisha University Kyoto, Japan. 1984 Contemporary Indian Painting Exhb., Cuba and Mexico. 1984 South Zone Cultural Centre Exhb., Madras. 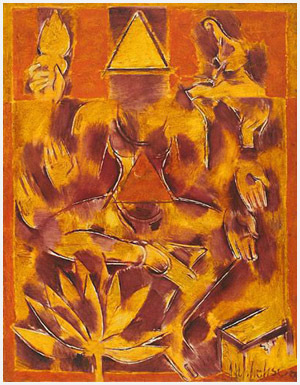 1985 Solo exhb., Krithika Art Gallery, Bangalore. National Gallery of Modem Art, New Delhi. Lalit Kala Akademi New Delhi. National Museum Art Gallery, Chennai. Karnataka Chitrakala Parishath Art Gallery, Bangalore. State Lalit Kala Akademy, Bangalore. Asian Christian Art Association, Indonesia. Kansai Seminar house Kyoto, Japan. Gabriele Von Schoeler Jesuiten Mission Nuremberg, Germany. 1968 Recipient of International Cultural Centre Award, New Delhi. 1969 Kalidasa Exhb. Gold Medal, Bhopal. Award, State Lalit Kala Academy Tamil Nadu and Karnataka. 1968 National Award, Lalit Kala Akademi, New Delhi. 1983 Travel Scholarship, Asian Christian Art Association, Japan and Christian Conference of Asia, Singapore. 1985 Travel Scholarship, Air India, Bombay and ICMC, England. 1985 Travel Scholarship, Gangotri Art and Culture Centre, Ahmedabad. 1992-97 Principal of Deptt. of Art and Culture, Govt. College of Arts and Crafts, Madras.